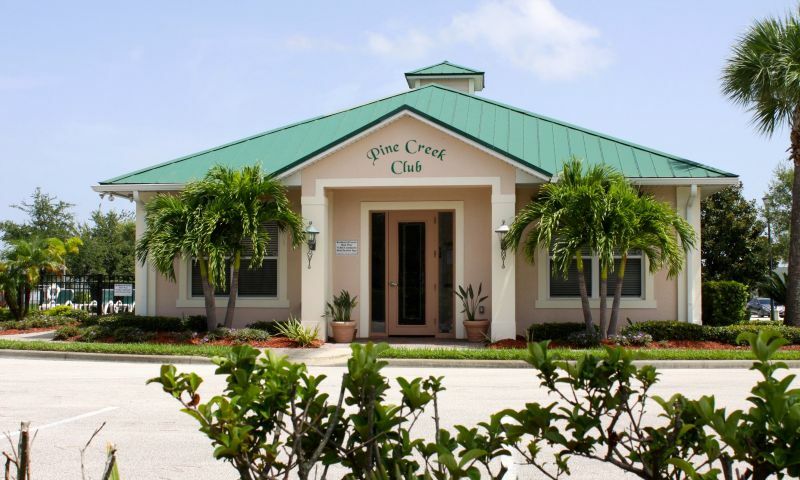 Pine Creek in Melbourne, Florida, is a lovely gated community that welcomes residents aged 55 or better. Built by Lennar Homes, this popular development features quality low-maintenance single-family homes and a central clubhouse with several desirable amenities. Residents can easily enjoy meeting for a game in the card room or hanging out with friends at the outdoor swimming pool and spa. Pine Creek s great location puts it in close proximity of many shopping and dining opportunities. Residents will also be happy to have convenient access to quality medical centers, beautiful beaches, major roadways and Melbourne International Airport. The activities at Pine Creek are largely centered around the spacious community clubhouse. The clubhouse has many popular features like a hobby and game room, billiards, and a card room where residents get together for a game of poker or to play pool. The cozy library is a great spot to relax with a good book or meet friends for a quiet discussion. There is also a large ballroom that is an ideal spot for community events, parties and activities where neighbors can mingle or dance the night away. This lovely recreational center includes many amenities to support a healthy active adult lifestyle as well. Those who want to stay in shape can conveniently workout in the exercise room instead of driving to a crowded gym and pay membership fees. They can also choose to swim laps or take a water aerobics class in the outdoor swimming pool, or simply relax in the outdoor spa. Outdoors, Pine Creek residents can enjoy living on beautifully maintained grounds that include picturesque ponds. They can also enjoy the peace of mind that comes with living in a private gated community. Built between 2002 and 2004 by Lennar Homes, the 190 homes at Pine Creek were designed with low-maintenance living in mind. The residences throughout the community are all detached single-family homes, which range in size from 1,330 to 2,018 square feet. Each home typically has two to three bedrooms, two bathrooms, and an attached two-car garage. Within these beautiful homes, active adults can find many desirable features, such as vaulted ceilings and 18-inch tile in the foyers. The spacious eat-in kitchens include touches such as Corian countertops, 42-inch cabinetry and upgraded GE appliances. Gorgeous master bedroom suites include walk-in closets and bathrooms with double vanity sinks. With pavered porches and driveways, and professional landscaping, the homes at Pine Creek have plenty of curb appeal. Many homes overlook open green spaces and there are some waterfront homes as well. Low-maintenance living frees active adults to spend more time pursuing their own interests. At Pine Creek, the homeowner s association (HOA) maintains every home s exterior, including the roof, lawn and sprinkler system. Home exteriors are also repainted every seven years, which keeps the whole community looking great. There are many social activities at Pine Creek that keep active adults busy all year long. Residents frequently meet for games of bridge, canasta, bingo, poker and billiards. Those who share special interests, such as knitting, also get together to participate in the hobby together or simply to socialize. Whether joining a water aerobics class or attending a group luncheon, there are many ways for Pine Creek residents to take part in community activities while getting to know their neighbors. Set in the sunny city of Melbourne Pine Creek residents enjoy beautiful weather throughout the year. The community is conveniently located near many dining, shopping, cultural attractions, and is within close proximity of gorgeous beaches and quality medical facilities. While there is plenty to do in the Melbourne area, Pine Creek residents can also find that the community's great location makes it easy to travel to new places. Convenient access to I-95 is appreciated for both local commuting and longer road trips. Pine Creek is also located just minutes from Melbourne International Airport. Active adults can find a peaceful and low-maintenance lifestyle with clubhouse amenities at Pine Creek in Melbourne, Florida. There are plenty of activities available in Pine Creek. Here is a sample of some of the clubs, activities and classes offered here. Single-family homes range from 1,330 square feet to 2,018 square feet. These floor plans feature an attached two-car garage, vaulted ceilings, spacious eat-in kitchens, large master suites with walk-in closets and bathrooms with double vanity sinks. Please Note: Floor plans are not available at this time. 55places.com is not affiliated with the developer(s) or homeowners association of Pine Creek. The information you submit is distributed to a 55places.com Partner Agent, who is a licensed real estate agent. The information regarding Pine Creek has not been verified or approved by the developer or homeowners association. Please verify all information prior to purchasing. 55places.com is not responsible for any errors regarding the information displayed on this website.